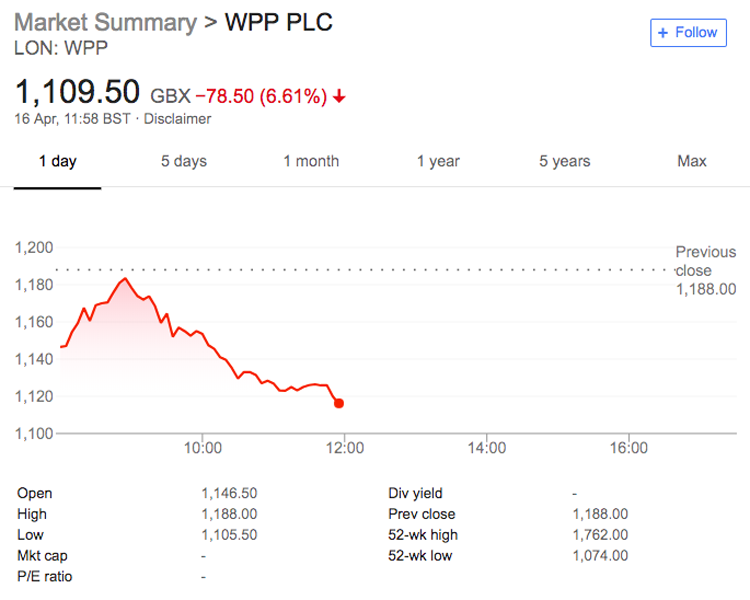 WPP's share price has gone into freefall and is now 6.6% down after a brief recovery this morning following from a - 3.5% start as investors reacted to Sir Martin Sorrell's dramatic exit over the weekend. Sorrell’s departure was announced on Saturday night as WPP concluded an internal investigation into an allegation of personal misconduct against the long-serving chief executive. The world’s biggest ad company’s share price was 3.5% down at 8am this morning but has ticked back up to -1.26% down from previous closing to 1,173p a share, despite speculation over the future of the company now Sorrell is leaving after 33 years. It has since become a moving target, dropping from -1.8% to 4.3% during the publication of this article. It has since dropped further to 6.6% at 12pm. 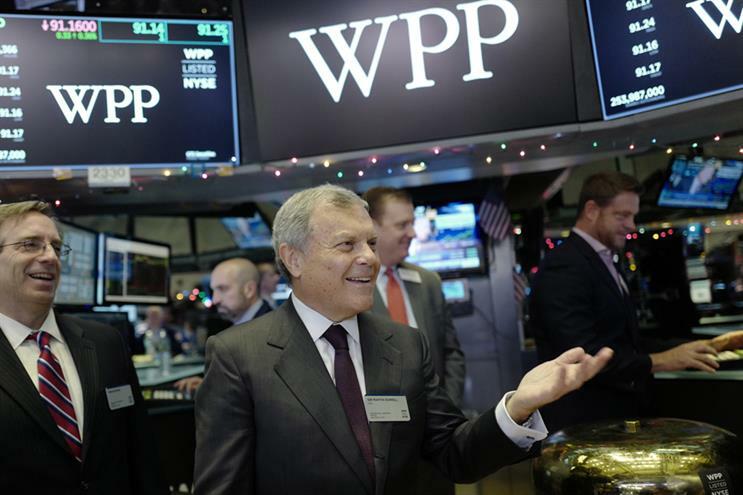 WPP’s share price is down 11% year-to-date following an underwhelming 2017 financial report amid a squeeze in agency spend from global FMCG giants. Could Sorrell start a new company? Liberum’s Ian Whittaker played down a suggestion that Sorrell could start a new advertising company, following today’s Financial Times story that he did not have a non-compete clause when negotiating his exit from WPP. "We would not read too much into this given Sir Martin's age but, more importantly, that WPP is his creation and he would not want to do anything that would be seen as damaging the company. Sir Martin still owns about 2% of the shares," Whittaker said. Whether Sorrell decides to start a new competitor to WPP, the advertising giant is in for a bumpy time. Without a leader at the helm, WPP could be vulnerable to a bid approach, acknowledged Paul Richards, media analyst at Numis Securities. While he seems to regard this as unikely, he does believe that the succession question has led to increased focus on the size and scope of WPP. "We can see a change of management accelerating the current process of reducing overlap and increasing flexibility," Richards said. Pivotal’s senior research analyst for advertising, Brian Wieser, stated he would not be surprised if some of WPP’s assets were "pruned" to make it more manageable. A candidate for sale, Whittaker theorised, would be Kantar or the group’s entire data management unit. "We have previously stated that WPP could raise £3.5bn from the sale of its data management unit as WPP is unusual amongst the big global agency groups in having such a large exposure," he said. "Our view is that Sir Martin was the main supporter of keeping this unit within WPP. Obvious buyers include rivals such as Nielsen but also private equity (KKR had, for example, bought out the listed minority at rival GfK)." Succession plan in place or not, Sorrell will be a hard man to replace, agree analysts. Respected and sometimes feared, Sorrell was a "tour de force", reminisced IPA’s director general, Paul Bainsfair. "It's an understatement to say he will be a hard act to follow." The real challenge is perhaps not so much ability alone, but also finding someone with relevant experience who will also be accepted, Keith Hunt managing partner, Results International, commented. "Publicis went through a similar process to replace Maurice Lévy recently and that turned out to be reasonably bloody. There is no way on earth that WPP would want to look at that shortlist of candidates and in essence, pick someone to replace Sir Martin who was rejected by Publicis!"